The resignation announcement of FIFA President Sepp Blatter caught even some of his harshest critics by surprise. "This makes me want to break into the song, 'Ding dong the witch is dead,'" said Andrew Zimbalist an economics professor at Smith College and a leading expert on the business of sports. "I've been saying I didn't think he was going to last very long. But I'm still surprised by the timing of it." Blatter was re-elected to his post last week, just days after top FIFA officials were arrested in Switzerland on bribery and corruption charges. And he showed no signs of backing down after his re-election. A New York Times report on Monday tying FIFA Secretary General Jérôme Valcke to $10 million in bank transactions that were used as bribes is probably what's behind the resignation, according to Zimbalist. Valcke, who is Blatter's No. 2 and close ally, denied to the paper that he authorized the payment. But the Times reported that United States officials and others briefed on the case say Valcke is the "high ranking FIFA official" referred to but not identified in the indictments unsealed last week. 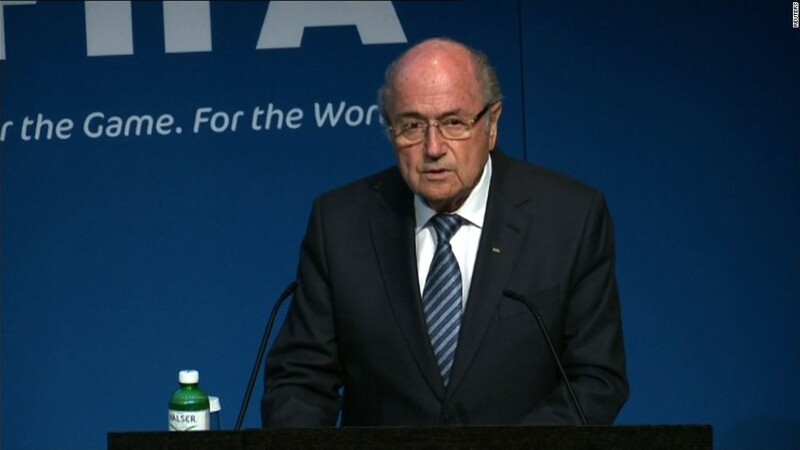 Blatter said he will remain in office until FIFA's executive committee organizes a vote for his successor. Major FIFA sponsors applauded the move, including Visa (V), Adidas (ADDDF), Anheuser-Busch (BUD) and McDonald's (MCD). In a statement, Coca-Cola (KO) said, "Our expectation remains that FIFA will continue to act with urgency to take concrete actions to fully address all of the issues that have been raised and win back the trust of all who love the sport of football." FIFA's celebrity critics took to Twitter to say how thrilled they are to see Blatter go. John Oliver tweeted a picture of a bucket of Bud Light Lime with word "champagne." He said on his HBO show Last Week Tonight that if Blatter is forced out, he will happily drink a Bud Light Lime, made by Anheuser-Busch, even though it tastes like a "puddle beneath a Long John Silver's dumpster." Virgin Group founder Richard Branson's tweet was less colorful but equally celebratory: "Finally Blatter resigns - opportunity for FIFA to rebuild trust in the beautiful game."